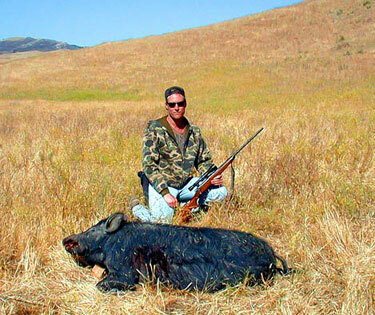 My good friend Charles recently asked if I would like to join him on a one-day guided pig hunt in central California. For as long as I can remember I have wanted to hunt wild pigs, but on a couple of prior trips  which were unguided  suitable game was not to be had. Because of this I was at first a little hesitant. This trip, I was assured, would be different. We would be hunting the 110,000+ acre Jack Ranch with an experienced guide with a long history in hunting this and neighboring land. As the saying goes, "The third times the charm!" Our guide, Bert Claassen, and his friend Darby met us early and the four of us were off. Both Charles and I had hunted upland birds and waterfowl but did not have a lot of experience with large-game rifle hunting. In fact, I had just purchased the Remington 7mm that I was using and had only put three rounds through the pipe prior to this hunt. Bert and Darby made us feel comfortable and quickly brought us up to speed with some of the particulars in locating our quarry. Charles and I both wanted a boar so our options were narrowed from the start, which meant we passed up numerous shots throughout the morning on sows of various sizes. Then, within the third hour of light, we spotted a big boar. We estimated him to be 350+ pounds and he was marching up the side of a steep hillside 400 yards away. We hopped back in the truck and pursued it along the dirt road that would wind its way close to the crest of the hill. Our guides worked their way up to the crest on foot to try to flush him out to our positions but he must have worked his way out the backside before they arrived. Three young sows, each around 100 pounds, did flush and presented me with an easy 30-yard shot, but I held to our plan. When we broke for lunch, I began to wonder if I was making the right choice to limit my scope to only a boar. After discussing this with Darby, he pointed out that if we chose to take a sow as well as a boar, there would only be a nominal additional charge. Armed with this knowledge and a good lunch at the local café, we were ready for another go. We first stopped in at the ranch headquarters to see if the manager had scouted any boars out recently. He was able to point out a far-off corner of the property where he remembered seeing a boar or two recently. Twenty minutes later we had made our way up to the brow of a well-shaded, northern-facing hill where we expected the animals were bedded down. The guides directed us to hike down to the basin and once we were in position they would try to push the game down to us. On the first half of the hill nothing moved and we began to think that we were coming up empty. Then they signaled that they had spotted a large boar near the top. To make things more interesting, he was in the middle of an afternoon love session with one of his harem. From my vantage point, I couldnt locate them through the trees. Charles had better position but the nearly 300-yard distance did not present an ideal shot. We signaled for our guides to push the animal down for a better angle. I guess the huge rock hurled down on his backside was met with less than joy. The boar dismounted and postured as if he would charge whatever dared interrupt his prime time. To his good fortune, he thought differently. To our misfortune, he decided to stomp away around the far end of the hill. This move gave neither of us a shot. This commotion, however, caused a stir among several of the other hogs that were bedded down across the landscape. As our guides chased after the boar, a group of eight or more hogs started to become unsettled and were circling on the slope above us trying to figure out where the threat was. As Charles and I anxiously looked on, I could see motion on the valley floor to my right about 70 yards the other side of my partner. I quickly alerted him to the convoy  two adults and three little squealers. Charles spun and fired once. The hogs were running full speed and three strides later one of the big ones ran out of gas and took in its last mouthful of dirt. I immediately looked back uphill and found the group had determined the threat was genuine and was picking up speed along a horizontal path heading the other direction. I brought the rifle up and tried to determine in a flash if any were boars. Needless to say, I couldnt spend a lot of time trying to figure this out since they were a good 200 yards out. Instead I focused in on one of the larger specimens and worked the cross hairs onto its front shoulder. The shot echoed off the hill and the bullet reached its mark. The pig made every effort possible in that split second to avert the inevitable but it was futile. As it folded over, the grip it held on the narrow path was gone. This fold turned into a slide, which then turned into a roll, which then turned into a head-over-hooves tumble all the way down to the bottom of the ravine. It was not a pretty sight but I think Bert and Darby appreciated that the retrieval process would be a snap for this one. In a matter of seconds we both had snapped the nagging question of whether we would go home empty-handed again. We both took satisfaction that our shots were clean, quick kills right through the boiler room. We had both scored hits on 200+ pound sows. The fact that they werent boars didnt upset the experience. The first will remain vividly etched in my mind. Bert and Darby quickly loaded the game and we blazed a trail after the boar that had slipped through our fingers. They had visually followed the animal for a mile or so to an area where they figured he took refuge from the sizzling sun. We identified a small, sloped area called the "tules" where a source of fresh water sprung to nourish a muddy runoff that extended down the hillside for several hundred yards. The muddy center was nearly 10 yards wide and had lush growth that rose a couple of feet high. This was perfect cover and prime cooling muck in which to hide. We approached from the side with Charles and the guides heading toward the top end where denser cover would abound. For some reason I had a hunch that he might have worked his way farther down. I split off and headed about a quarter-mile down. The hog leapt out of the mud as if launched before my eyes. My adrenaline surged as I back-peddled. Luckily for me the pig was on the opposite side of the mud but still within 12 yards. As I backed up, my heels caught the hill and momentum quickly brought me to my tail. The animal was scrambling up the opposite embankment and I knew I had to act fast. Before I could think, I had the rifle up and acquired sights on the animal and touched off the shot. It immediately responded and came rolling back into the mud belly up. I couldnt believe how quickly it all happened but couldnt help thinking that it was the boar. Our guides arrived in a flash and let the air out of my balloon  another big sow taken within an hour of the first. I have to admit, I was more than a little disappointed that it wasnt the boar. But I guess thats how it goes with hunting. Bert and Darby continued the pursuit but to no avail. They stuck with us until sunset and never showed signs of wear. In this case, the big boar will live another day and live to romance again. Overall the day was exceptional and the adventure greater than any I have ever had before. You can guarantee that Charles and I will be back! If you are interested in booking a hunt or just getting more information, contact Darby Neil at (805) 772-1222 ext. 11 or Bert Claassen at (805) 467-3262. Tell them you read about their hunts at WesternHunter.com.